Fish- what are we buying in the supermarket? I'm not sure about shellfish farming, will have to look into it a bit more, but as they are filter feeders I assume that sustainable water quality is a far greater priority. Thank heaven for that! I really don't want to have to give up my Conwy mussels from the fishmonger. According to River Cottage Cookbook, Hugh F. W. reckons that because supermarkets have a 4 day shelf life for fish, they should be reasonably fresh (he's never smelt our local asda's fish counter). a good tip though is because us brits eat a lot of fish on fridays, this is the best time to buy fresh fish as thats when supermarkets get their biggest delivery. As well as being low-input and improving water quality, farming obviates the wholesale habitat destruction of bottom trawling. No question, such farming is 'a good thing'. which is a US site that brings together the recommendations of a number of environmental, conservation (and even medical) groups on this very subject. I have no problem agreeing that salmon farming has a considerable room for environmental improvement. I have to wonder whether the farming of 'bottom-feeders' in conjunction with salmon, and possibly moluscs too, might result in a more efficient use of resources and less environmental impact... Wouldn't do anything much for the escapee problem though. I'm surprised not to have noticed anything about bio-control of sea lice, rather than chemical control... is there a natural sea lice predator? That could itself be farmed? A major fish farming problem is the input of fishmeal. However, only some fishmeal comes from sand eels. I believe there are experiments with some kind of crustacean suspended below or near salmon cages to mop up the waste. Living in Brixham and having worked on the trawlers luckily i still know enough people to be able to walk on the quay and walk back off it with a bag of free fish and can honestly say i have never paid for any fish ever,how lucky is that ?? talking of fish i best get my self sorted as off cod fishing off berry head in about 10 mins weeeeeeeeeeeeeeeeeeeeeeee! The MCS published a report relating to supermarkets and how they stock/source fish. P.S. - M&S came first. Dougal touched on an interesting subject in this thread, one which is very close to my heart. Salmon farms are one of the biggest environmental disasters ever to hit the coasts of scotland. Rather than rant about it, I'll post this link and let you make your own minds up. our local Lidl supermarket is selling frozen lobsters at �4-99 - has anyone heard of farmed lobsters? They all weigh in at 400 grams. Lobster farming is less straightforward than prawn farming. The little darlings fight too much and if they don't eat each other they have each others claws off. In some parts of the world lobster farming is all about growing them up to a size where they can be released, thus artificially replenishing wild stocks. I think that theres some lobster farming in Norway, and theres some talk of building artificial reefs for lobster 'farming' off some Scottish sea lochs, but I don't know any details. They are probably caught off the canadian coast, tesco are selling lobster thermidor as well if the adverts are correct. As a big lobster fan I would say the only way to really do it justice is to buy one alive and cook it yourself. With a bit of luck a tenner will get you one about 500-600g. 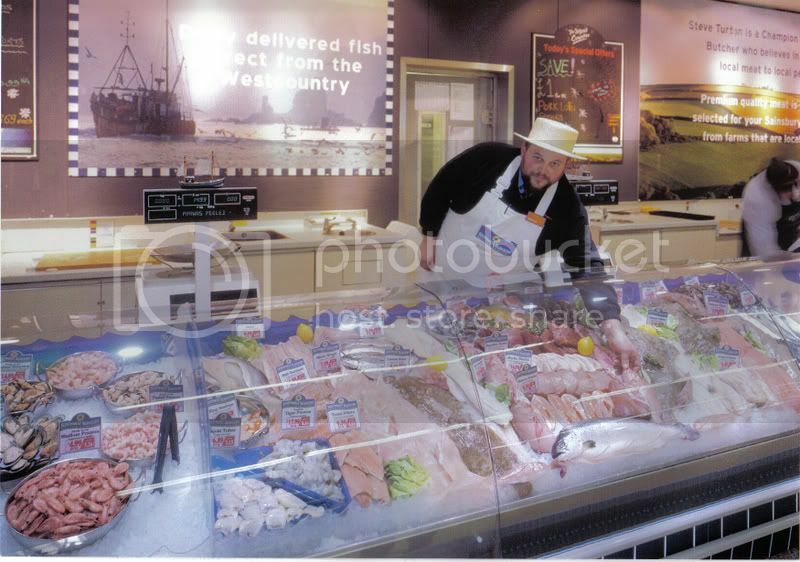 some interesting posts,ive been a professional fishmonger for nearly 20 years,and have seen the best and worst in fish,ive worked(managed) fish counters for sainsburys and tesco,and have worked the markets too.the only fish counters in supermarkets i could honestly recomend would be the sainsburys fish counters that are suplied by south west seafoods based in plymouth.i cant vouch for the expertese of the staff as i havent met a true fishmonger on one yet,but on the whole the fish is very good,a shelf life of day of opening the pod + 2 days,the pod unopened could be kept for 3-4 days so ask to see the tracability of the product,the pods are gas flushed to aid preservation by a non toxic gas and leaves no taint.NEVER buy fish from anywhere on a monday as there is no fish market on a sunday ,so the fish has been in store or in a whare house since at least saturday.the best days to buy fresh fish from a supermarket is thursday,friday and saturday. as for farmed products there are a few,but if you are fussy try something else,and please DONT buy cod in any shape or form,theres no need,there are others just as good if not better,try pollack,coley,whiting or red fish. by far the best way to get great fish is buy from a boat when it comes in,but be warned make sure its just come in! theres a guy who sells 'direct' from his boat on poole quay,only problem is ive seen the box's marked with wholesalers stamps! any questions regarding fish ide gladly try and help,or meat for that matter as ime also a qualified butcher. heres me at sainsburys last year!